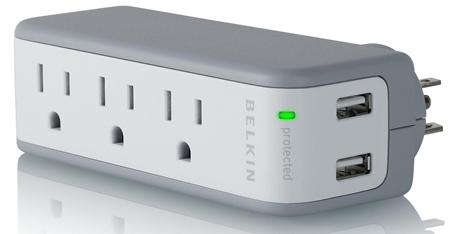 On my last trip of the summer, I brought along my latest travel buddy: the Belkin Mini Surge Protector with USB Charger. It includes three AC outlets and two USB outlets. That means you only need to find one free outlet at an airport or in your hotel room, and then recharge five devices. Plus, as the name says, it’s got a surge protector built in. It weighs practically nothing and is very compact – only five inches long. If you travel with a laptop and a smartphone, you’ll definitely want one of these. Charge everything in one place – no more devices strung all over your hotel room! It’s nice to know that, even as our technological lives get more complicated and messy, there is a continual stream of products that aim for simplicity. It puts a smile on this organizer’s face!